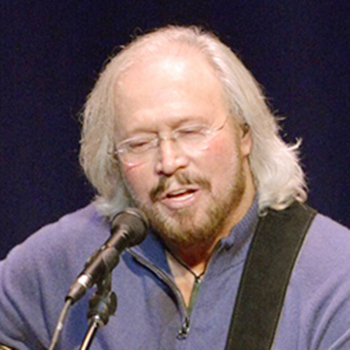 Groundbreaking a winner for MT..
Barry Gibb named inaugural fel..
Music icon Barry Gibb easily traced the genealogy of the Bee Gees classic “How Can You Mend a Broken Heart?” for more than 900 fans and friends at MTSU’s Tucker Theatre Monday night, Oct 28. The evening’s visit to MTSU, part of the Department of Recording Industry Chair’s Speakers Series, was the first time Gibb has ever sat down for a public conversation and solo performance. John Merchant, a recording industry assistant professor who toured with Gibb for years as part of his concert sound production team, invited his former boss to the university. Before the Tucker Theatre event, Merchant’s colleagues Michael Fleming and Matthew O’Brien introduced Gibb to several MTSU students who work on the student record label, Match Records. Fleming also showed Gibb’s son and touring partner, Stephen, and musical director Doug Emery one of the university’s state-of-the-art recording studios inside the Bragg Mass Communication Building. Music icon Barry Gibb sings and plays the country classic “Send Me the Pillow That You Dream On,” the first country record he recalls hearing, during a performance-lecture at MTSU’s Tucker Theatre Monday night, Oct. 28. The artist also was fascinated by the Center for Popular Music’s compact-shelving storage system, a customized archive that stretches more than 10.5 feet high to house the center’s extensive collection. “It’s obviously not possible for us to cover your entire career in one night, so the only solution is for you to come back again,” Keel said to the broadly smiling Gibb after the presentation.